polish insomniac: New Soy Based Nail Line! Exciting News Eco-Conscious, Soy, Vegan and Nail Lacquer Divas! 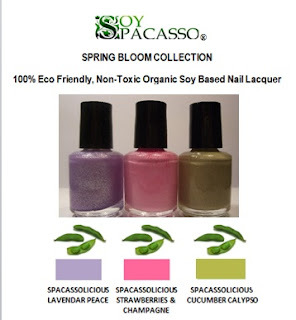 SOY SPACASSO the well-known professional company based in Des Moines, Iowa who produces decadently fragranced, delicious tasting, multi colored and healthy organic soy based skin care products and aromatic soy candles, has expanded their line this spring with the launch of their unique line of certified non-gmo organic soy based nail lacquers that any eco-conscious, soy, vegan and nail aficionado will fall in love with. The first 10 lacquers introduced come in beautiful vibrant hues ranging from shimmering gold and ruby to glossy mango papaya and lavender which are either in the Spring Bloom Collection, Exotic Summer Collection or Queen Jewel Collection. Each lacquer provides a very durable, very long lasting, chip resistant and high gloss finish that will give the consumer fantastic results. Please meet the soy nail lacquers now. 100% eco-friendly and nontoxic for the environment and consumer, the “SPACASSOLICIOUS” nail lacquers do not contain any of the following harmful ingredients: camphor, formaldehyde, toluene, xylene, dibutyl phthalate, ethyl acetate or FD&C colors. Our water based polymer is certified AP non-toxic. 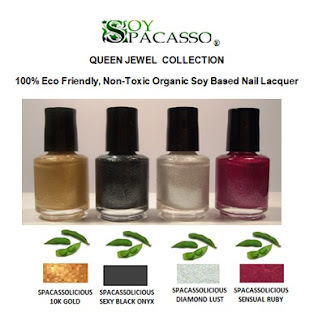 The “SPACASSOLICIOUS” nail lacquers are free from harsh chemical odors, can be removed with fingernail polish remover of choice and there is absolutely no animal testing. As expected from everything in the SOY SPACASSO product line, the organic soy formula provides moisturizing and nourishment with Vitamins A and E, thus helping to eliminate breakage and keeps the nail from drying out. Consumers may use a base coat or top coat but they are not required. Being eco-conscious, SOY SPACASSO chose a 7.5 ml bottle for the lacquers and uses a natural stone from the earth as the mixing ball, instead of the commonly used non-eco-friendly metal ball bearing. 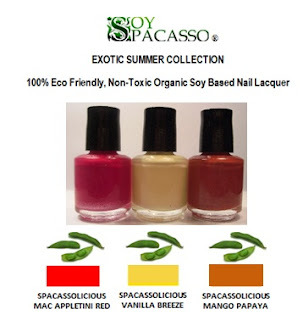 Four shades of the organic soy based lacquers already have popular complementary certified non-gmo organic SOY SPACASSO Mani/Pedi Soy Cream Exfoliators, Soy Radiance Whips and Soyjuvenating Lotions in Vanilla Breeze, Cucumber Calypso, Mango Papaya and Strawberries & Champagne for a woman to enjoy complete manicure/ pedicure experience. Look for it in a salon, spa or boutique near you. What do you think ladies? Is a soy-based polish something you would be interested in?